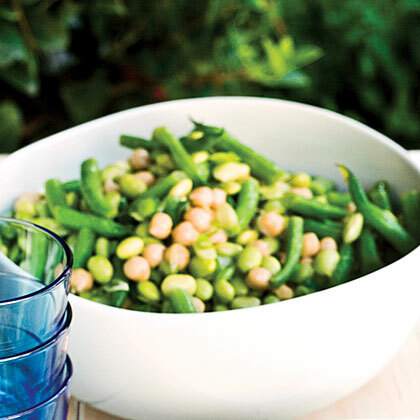 No canned kidney beans here--and the flavors get even better if you start the salad a day ahead. In a large saucepan fitted with a steamer basket, bring 1 in. water to a boil over medium-high heat. Steam edamame, covered, for 3 minutes. Add chickpeas and steam, covered, until heated through, 4 to 5 minutes. Pour both into a colander, then pat dry on a kitchen towel. Add to bowl with dressing and toss to coat. In the same saucepan, bring another 1 in. water to a boil. Meanwhile, fill a large bowl with ice water and set aside. Steam green beans, covered, until tender-crisp, 4 to 5 minutes. Pour into a colander and immediately transfer to ice water. Let sit 30 seconds, drain, and pat dry on towel.